Today the church celebrates the Feast of St. Blaise, Bishop & Martyr. You can read more about it in my previous blogpost here. In my own family though, we remember the death of my grandfather, 1 year ago today. Grandpa Bruns’ obituary is listed below after my comments. Grandpa used to own Bruns Bros. Seed Company with his brother, they used to farm together, and then later on Grandpa owned and operated his trucking business. I remember going to visit Grandma and Grandpa and sitting in the brown chair next to the tv in the living room, and seeing Grandpa’s picture with his red and white truck on the bookshelf behind me. Dad always told (and still does) my brother Brody and I stories of working on the farm with Grandpa, as well as growing up with him. I remember driving to Nate & Jackie’s wedding with Grandpa and Grandma and how Grandpa left his turn signal on. I remember as a kid when they used to decorate the evergreen tree with lights in front of their house, before they had to have it cut down. I remember Grandma and Grandpa always together, loving one another and being so cute together. They really showed what it meant to be married for life and to stick through the good times and the bad. Having been married for almost 71 years, Grandma and Grandpa were always a great example to me of the Sacrament of Matrimony. Of the many things that I miss about Grandpa, I know that his memory will always live on in my life, his witness on what it takes to be a gentle man, firmly founded in Christ. I know that each time I sign my middle name of “Dale,” I share his first name, which is also my dad’s middle name. I know that each time I stand next to my family and realize that I am the tallest, I received his gene for height. I know that he is on my mind when I open my breviary to pray the Liturgy of the Hours at the first point and the last point of the day. (On the inside of my breviary I keep a card with his picture on it, as well as the letter my Grandma sent me after his funeral saying how he was so proud to have had 8 grandsons to carry his body to his final resting place. When I see his photo, I am reminded of the many memories of him, as well as the invitation to pray for the repose of his soul. Last year on February second, I was driving back from St. Meinrad with Andrew Thomas, (a seminarian from Evansville) who had fallen asleep in the passenger seat. I hadn’t talked with Grandma and Grandpa in a while, so I called Grandma to visit. I visited with her and Aunt Marlene, but my Grandpa had been having some ailments and wasn’t able to speak very well as he was short of breath. I remember hearing him say in the background to Grandma: “Tell Corey I said hello and thanks for calling.” I remember Grandma saying to call back a few days later, and he should be able to talk. Sadly, that was the last time I would hear him speak. We had just finished Mass at the seminary on Sunday morning and because of an event, we were moving our Holy Hour up to right after Mass. Sitting in the pew prior to the Holy Hour, I remember pulling my phone out to make sure it was on silent and seeing a text from my Mom, explaining that Grandpa had passed away in the middle of the night. I rushed out of the chapel, tears coming down my face and was met by Fr. Bob, our Rector getting ready to walk in. He gave me a big hug as I told him the news, and he told me that I could go back to my room and compose myself, but encouraged me to come back and offer the remainder of the Holy Hour up for the repose of my Grandfathers soul. I did just that, and am so thankful that I did. It really helped me to think of the priesthood in a new way. Here I was, separated from all of my family by multiple hours of driving, so who did I have to grieve with? I had the Lord. And the Lord in the last half hour of adoration really helped put my feelings aside and let me know of his presence in my sorrow. My Vocation Director was coming the next Thursday for evaluations and I knew that I needed to be there for that. Thankfully the family was able to put the funeral off until that Sunday. Saturday, after saying goodbye to my Vocation Director, Jacob who was applying, Sam, and Fr. Bob, I hopped in my packed car and drove the 5 hours to Quincy, arriving 3 hours before the Visitation. My Mom, myself and other family members had Masses said for Grandpa’s soul, and I offered up the Office for the Dead for him when I prayed Evening Prayer at the Visitation. I remember not being able to look at his body in the coffin without crying, so I chose to look elsewhere, at the flowers, pictures of him, etc. The morning of the funeral came and I remember walking with Grandma out to say one last goodbye before they closed the lid of the coffin. Seeing her bend down pat his hand and say goodbye, made me lose it, but in a good way. I saw true love in the two of them, and I know that God blessed them in abundance with many happy years. My Grandfather Dale Bruns lived 93 years. 71 of which he spent married to my beautiful grandmother. 18 of those years, he was in my life and I am forever indebted to him for his influence on my life and the man I have become. Carrying him out to the grave was a memory that will live in my mind forever, but so too do the good memories. I am thankful for getting to share both his first name of Dale and his last name of Bruns, and I pray for his soul each day. I ask that you would remember his soul in prayer especially today, as well as my Grandmother’s intentions. Today at our Seminary Mass, Fr. Bob is going to offer Mass up for the repose of Grandpa’s soul, something which I hope to have done each year on this date. Thank-you so much Grandpa for who you were on this Earth and who I am because of you. I love you and I miss you so much! 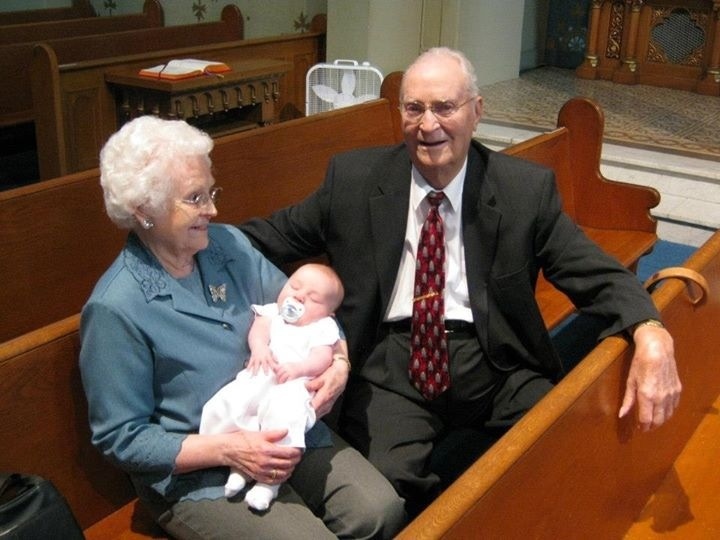 Grandma and Grandpa Bruns with my nephew and their great-grandson Oliver at his baptism. CAMP POINT, Ill. — Dale Bruns, 93, of Sunset Home in Quincy, formerly of Camp Point, died at 12:35 a.m. Sunday (Feb. 3, 2013) at the home in Quincy. 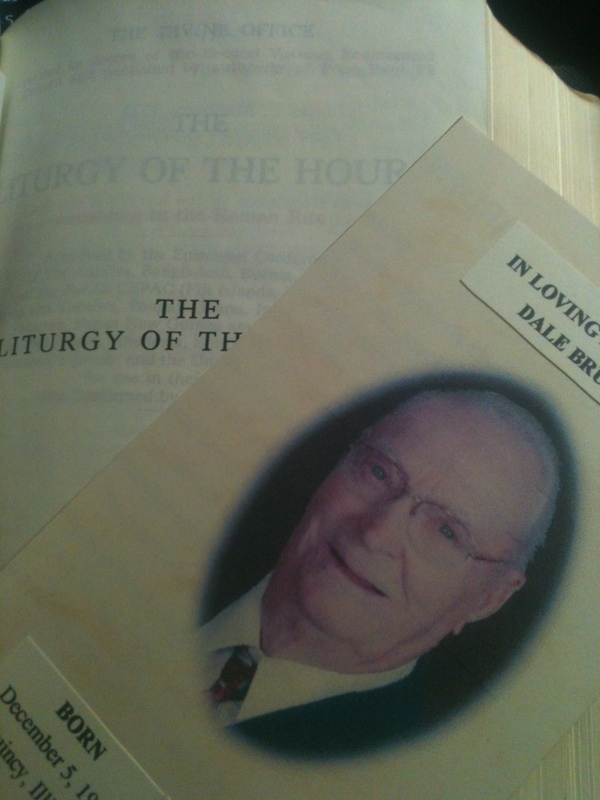 Born Dec. 5, 1919, in Quincy, Dale was a son of Harry and Ethel Smith Bruns. He married Wilma Richards on May 14, 1942, at the Barry Methodist Church parsonage in Barry. She survives. Dale was a farmer, an owner of Bruns Bros. Seed Company, and also was the owner and operator of Dale Bruns Trucking in Camp Point. He was a former member of the Camp Point Lions Club, was a volunteer fireman for the Camp Point Fire Department and had served as fire chief for five years. He enjoyed playing golf and was the first person to fly a plane solo from Baldwin Field. Dale was a member of the Camp Point United Methodist Church and a graduate of Maplewood High School in Camp Point. Survivors in addition to his wife are a daughter, Marlene Churchill (Joe) of Quincy; a son, Larry Bruns (Susan) of Marion, Ky.; nine grandchildren, Brian Craig (Tana Parsano) of Golden, Brenda Hill (Casey) of Fowler, Adam Bruns (Tammy) of Quincy, Nathan Bruns (Jackie) of Quincy, Corey Bruns, Brody Bruns, and Emily Bruns, all of Marion, Andrea Knapp (Ken) of St. Louis, and Joe Mays (Kelly) of Quincy; three stepgrandchildren, Jill Churchill of Quincy, Tom Churchill (Susan) of Boulder, Colo., and Brad Churchill of Quincy; 15 great-grandchildren; a sister, Doris Sapp, Quincy; a sister-in-law, Johanna Bruns of Winchester, and several nieces and nephews. He was preceded in death by his parents; two brothers, Norman Bruns (Evelyn) and Wayne Bruns, and a brother-in-law, Gene Sapp. My goodness, what can I say…. What a beautiful tribute to Grandpa! He would have been so pleased and so humbled by your loving, caring thoughts. He was not a man of many words, but he certainly has made an impact on many lives, and certainly yours. Yes, he and grandma truly did love and respect each other. I honestly can say that I don’t ever remember them saying angry words to each other. I remember the nights that he would get up in the middle of the night especially in the hot summer to haul some farmer’s livestock so that they would hopefully survive the sometimes long hot ride (unfortunately, for them, the slaughter house) and Grandma would also get up and fix him bacon and eggs before he left. Now that is true love.!! And, I always remember him giving her a kiss before going out the door. She was so caring of him…always watched his back even to the end. And, had the situation been reversed he would have done the same for her. Our world needs more loving down to earth couples like them. Yes, this has been a sad weekend for me, as well I know for the rest of the family. It’s hard to believe that he has been gone for a year. Thank you for writing this….I will see that Grandma and the rest of the Bruns family on my end get a copy. I will cherish it forever. I think that you will make a wonderful priest…your family is so very proud of you. You have a wonderful way with words….so loving, caring….God has truly blessed you, and all of us. Thank you, Corey for your kind and true words. As this is passed around the Bruns family, I know many tears will be shed. I know we aren’t suppose to have favorites and maybe because Uncle Dale lived in the town I taught school and was around me more, I have to admit he, a favorite, seemed to always brighten my day. Each and every time I stopped by to visit (your Grandpa would say it usually was meal time, which it was) your Grandma would get another plate and between the two of them, would share what they were having with me. When I would leave, your Grandpa would always thank me for coming to visit, give me a kiss, and would tell me to come back! I always felt my visit was a special part of their day! I know it was mine! I lost my Dad in 1995 and always wanted to make good decisions when it came to my Mom. I had many talks with your Grandpa about her. We would laugh about her being the baby of the family and a stubborn German! My Mom too, dearly loved her brother/your Grandpa and said she cried and cried when he and your Grandma got married because he was moving out of the house and wouldn’t be there as before. As a Catholic, I want to thank you for the Prayers you have and are saying for my Uncle Dale. He WAS a wonderful, caring man and you can be proud to be a Dale and a Bruns! I wish you the best in your study to becoming a Priest. We need talented, caring and thoughtful young men who will touch the lives of many. You are one! Thank you for the memories of the wonderful man you called “Grandpa” and I called “Uncle Dale”. We are two lucky people who shared much love for the same man. Again, thank you from the bottom of my heart, Corey Dale Bruns.